In this rare, rediscovered “By Request” ARMY-NAVY Screen Magazine episode, Mary Small sings requests from the troops. Incredible footage of American cities in the 1940’s. The Army-Navy Screen Magazine was a short film program, which was shown to the American soldiers around the world during World War II. It was produced from June 1943 until early 1946 by the Army Signal Corps under the supervision of director Frank Capra. Mary Small and other stars visiting soldiers, WW2. Thanks to phrases.org for this…. Gordon: Any word on that flight yet? Rangoon hotel clerk: Yes sir, it was attacked and fired on by Japanese aircraft. She’s coming in on one wing and a prayer. The phrase was taken up by songwriters Harold Adamson and Jimmie McHugh and their WWII patriotic song Coming in on a Wing and a Prayer, 1943 tells of a damaged warplane, barely able to limp back to base. Adamson and McHugh wrote several patriotic songs in World War II and were awarded the Presidential Certificate of Merit by President Harry Truman. The phrase hit a chord with the public and there are many references to it in US newspapers from 1943 onwards. 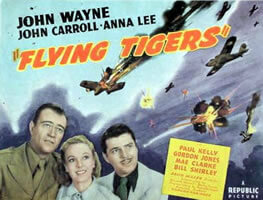 It was taken up by Hollywood and a film – Wing and a Prayer – was released in 1944.